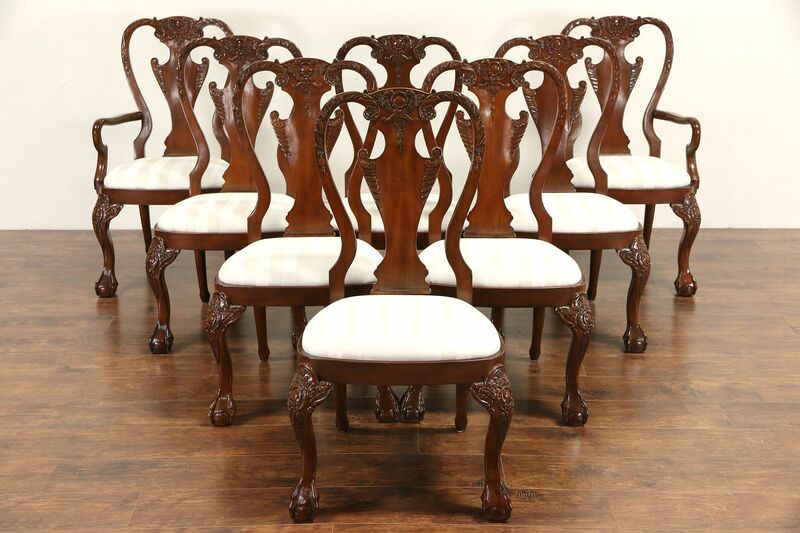 A set of eight solid mahogany dining chairs are about 15 years old, hand carved in the Georgian manner with claw and ball feet. The finish is in very fine condition with minor touchups and distressing to look antique. Large frames are tight and strong. Soft seat cushions have some spots, they are easily recovered to match any decor. This vintage furniture is unsigned, there are six side chairs and two arm chairs. Measurements are 24" wide, 26" deep, 41 1/2" tall, seats are 19" high and 16" deep.